Unprecedented Arctic warming over the past 30 years is leading to the melting of sea ice and other consequences. 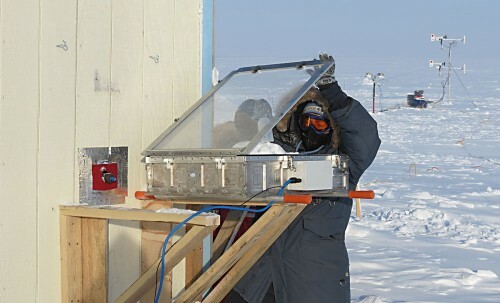 Now scientists have evidence that Arctic warming could also change atmospheric chemistry through chemical reactions that occur between the air and the snow that sits on the sea ice. Put simply, Pratt and her colleagues want to better understand what will happen to the atmosphere as temperatures rise and snow and ice decline. The study, which was supported by the National Science Foundation, was part of a larger, NASA-funded effort: the Bromine, Mercury, and Ozone Experiment known as BROMEX. Ozone in the lower atmosphere is different from the stratospheric ozone involved in the planet's protective ozone layer. This lower atmosphere ozone is a greenhouse gas that is toxic to humans and plants, but it also is an essential cleaning agent of the atmosphere. Interactions between sunlight, ozone and water vapor create an "oxidizing agent" that scrubs the atmosphere of most pollutants. Because freezing polar temperatures preclude the existence of significant water vapor, this cleaning process occurs instead via reactions on frozen surfaces involving bromine, a halogen gas derived from sea salt. This gaseous bromine reacts with and destroys atmospheric ozone. This aspect of the bromine chemistry works so efficiently in the Arctic that ozone is often entirely depleted from the atmosphere above sea ice in the spring. While it had been previously proposed that sea ice was the source of bromine, field experiments proved the source was not the ice, but rather the snow sitting on top of the ice. "We had an 'of course!' moment when we realized it was the snow on top of the sea ice,” said Pratt. "The snow is what is in direct contact with the atmosphere. Sea ice is critical to the process, though. Without it, the snow would fall into the ocean, and this chemistry wouldn't take place. This is among the reasons why the loss of sea ice in the Arctic will directly impact atmospheric chemistry." The team's findings suggest the rapidly changing Arctic climate - where surface temperatures are rising three times faster than the global average - could dramatically change its atmospheric chemistry, said Shepson, in a press release. Significant research remains to understand the processes and develop accurate climate models to predict how continued sea ice depletion will affect the atmosphere, said Pratt. The results of this study are an important step toward understanding the complex Arctic atmosphere. "We thought that the fastest and best way to understand what is happening in the Arctic was to go there and do the experiments right where the chemistry is happening," Pratt said.